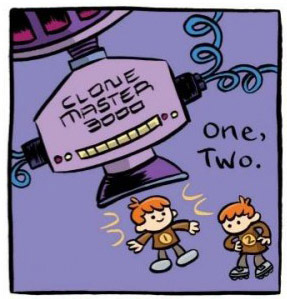 Easter egg alert: Any time you see little kids wearing numbered shirts they are probably clones! These guys appear in several short comics I’ve drawn over the years, most notably in the book Nursery Rhyme Comics. “They Might Be Giants” by Dave RomanA nerdy artist who grew up listening to They Might Be Giants probably isn’t too big of a surprise to anyone. If anything, it’s borderline cliché! Two years into high school (1992 or so), I found myself watching both Headbangers Ball (heavy metal videos) on MTV Saturday nights and 120 Minutes (alternative rock videos) on Sunday evenings, and loving elements of both pretty equally. Bands like Faith No More, Mr. Bungle, and They Might Be Giants, all of whom defied genre and dabbled in mash-ups, really excited me and have stuck with me throughout my life. Even though They Might Be Giants have a huge catalog of songs about almost everything in the cosmos—including the universe itself, and a whole album dedicated to science—surprisingly, I’ve never included specific references to the band (or any of their music) amongst all the pop-culture shout-outs in Astronaut Academy. 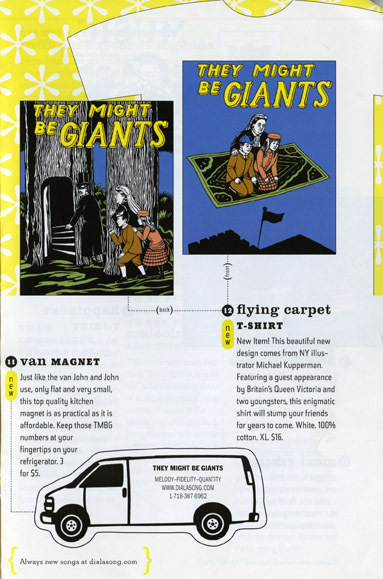 But presumably, TMBG’s quirky sensibility and strategic randomness has had a subconscious effect on the whimsy and genre mash-ups found throughout the series. I immediately responded to the eclectic mix of upbeat tempos and strange subject matter found on the album Apollo 18, my entry point to They Might Be Giants. And when I first heard Flood, while in the backseat of a friend’s car driving around Long Island, I was impressed how the older songs were even weirder, yet fun for people to sing along to. For all the bizarre lyrics and non-sequitur musical shifts, they still managed to have harmony and catchy riffs, unlike other art/noise bands that failed to click with me. The first time I saw They Might Be Giants live was in 1994 (during my senior year of high school) at a small show at Suffolk County Community College. 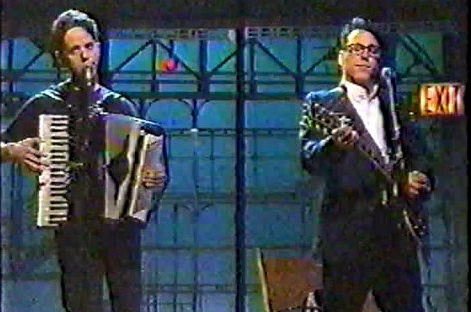 John Linnell and John Flansburgh were known as a nerdy musical duo, the guy with glasses playing guitar, the other guy playing an accordion; but on this tour (and accompanying album) they were backed by a full band. But this was still a far cry from the Metallica, Guns N’ Roses, or even Depeche Mode shows I had seen in the past. It was smaller, intimate, and lo-fi in a way that was more about the music itself. No one took off their shirts, no one stage dived, there were no giant monitors or laser lights…and yet the show still rocked, and everyone in the crowd reacted as if they were at a stadium event. 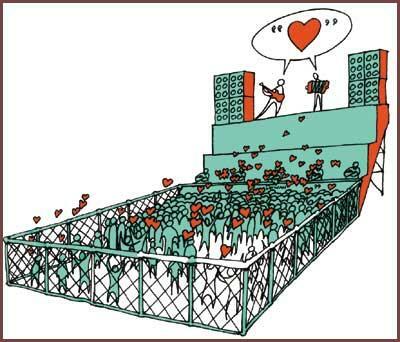 To be fair, there was a confetti cannon! The audience was not only at eye level with the band, it genuinely felt like we were all in on something. Not exactly a joke, but a show where it was okay to smile…especially when Birdhouse in Your Soul started playing. 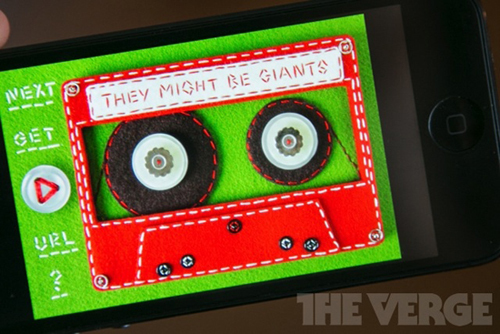 I had not yet learned the phrase “DIY,” but that was a huge part of the They Might Be Giants experience for me. Everything from their stage presence to their merch table seemed so un-rock star and so un-corporate (except when intentionally parodying the tropes), even though they were on a major record label (at the time), and were shilling all sorts of products from coffee mugs to refrigerator magnets! It all felt transparent, as a means of operation for a small but functioning business. 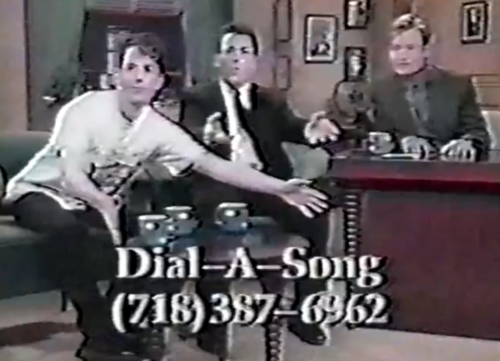 There was also free swag to be found at TMBG shows, including free stickers that included a phone number for a service called Dial-A-Song. A rock band with a phone number? How intriguing! For the price of a local phone call (or free from work, as they often noted) you could hear a different song played every day off their answering machine. Seems low-tech now, but this was before either the internet or cell phones had trickled down to the masses. 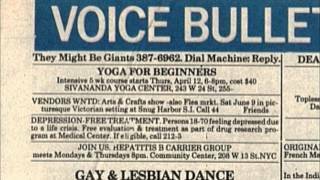 There was a creative mystique, almost like an urban legend, surrounding this mysterious answering machine that was supposedly set up in the band’s Brooklyn apartment, and was advertised on the back page of the Village Voice. I only called Dial-A-Song a handful of times but would compare notes with other fans. Sometimes you’d hear alternative versions of their songs, unreleased B-sides (which were harder to come by in those days), random ditties, and fake tongue-in-cheek commercials for the band (that still crack me up to this day). It was the band’s way of testing out new material, and according to people in the know, they produced over 500 different tracks over the lifespan of the machine! 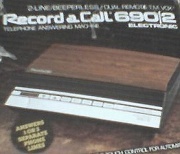 Eventually they abandoned the physical recorder that was Dial-A-Song for the internet, which opened a whole new world of DIY marketing opportunities. The band’s websites have always been creatively designed, and never held back on content. 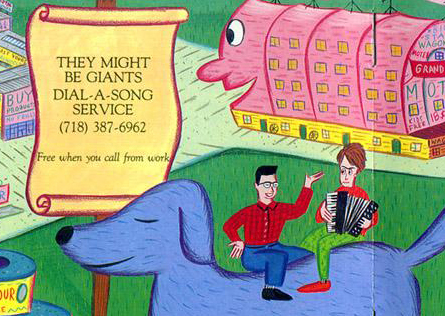 TMBG was probably the first band I ever saw to do MP3 exclusive albums and free music giveaways, a weekly podcast, and collaborative fan videos on the web. They even produced a flash-based downloadable clock radio that played a catalog of TMBG songs on your desktop. And just a few weeks ago, the band released a new They Might Be Giants app that builds off the clock radio idea, rotating a free mix of songs via one of the cutest interfaces to ever appear on your iPhone! Looking at the ongoing legacy of They Might Be Giants (1982-present; their new album Nanobots about to be released any day now), it is an inspiring blueprint for young artists, showing how you can think outside the box and survive several career ups and downs through hard work and engagement with your audience. They Might Be Giants are constantly reinventing themselves, and yet manage to always be consistent in their own distinctive way. What started as a quirky art-rock band has gone on to produce music for kids, adults, science programs, NPR, commercials, TV, movies, and pretty much any place music can be used. Part of their longevity comes from natural talent, but it’s also worth noting their willingness to adapt, try new things, and not be defined by any one label. I remember seeing the documentary Gigantic (A Tale of Two Johns), and being really impressed by all the interesting things John Linnell and John Flansburgh have done. And yet, that film is already 12 years old and They Might Be Giants have produced a ton of material since, never seeming to run short of creative avenues to explore…and seemingly staying humble in the process. True working artists.